Fylde Council has vowed to crack down on drivers taking ‘shortcuts’ across a beauty spot. Concerns have been raised over motorists driving on footpaths used by families at Fairhaven Lake in order to park closer to the water. Now Town Hall bosses are considering installing barriers to shut off access for drivers. Temporary bollards have already been put in place . And Coun Mark Bamforth, who represents St John’s Ward, is keen to see a long term solution put in place. He said vehicles started driving up and down the paths at the start of the year. And he fears the problem will get worse during the summer holidays. He said: “They have been driving on both sides of the lake. “We need to put an end to this because we have summer holidays coming up and the problem will just intensify if we don’t nip it in the bud. “It’s totally illegal and the footpath is very narrow. It’s an accident waiting to happen, and plus it puts people off visiting the area. “They feel intimidated if they see a lot of cars driving up and down. “There’s plenty of parking around the lake so there’s no need to take your vehicle down the footpath to park at the very edge of the lake. “It’s a beautiful area and that’s why people come along to look at the lake and the birds in the estuary. “It’s an open space for everyone to enjoy. “When people see people driving there they think they can do it too. Father-of-two Jonny Hart, from Commonside in Ansdell, said the cars using the footpath had caused him to ‘think twice’ about letting his children play at the lakeside. 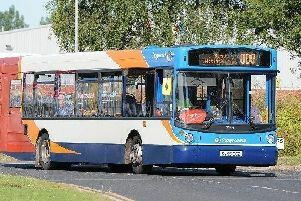 He said: “I think it is dangerous as I have two children who me and my girlfriend love to take for walks on Fairhaven. “We go to Fairhaven Lake for the park, boats and because it’s a safe area. “This has made me think twice about walking down there and letting the eldest run just in front of us. “With cars parked where they shouldn’t and drivers using the paths, you can’t exactly let the kids play. Fylde Council is aware of the problems at the lake are plans are being put in place to stop drivers using footpaths to get closer to the water. A spokesman said: “Fylde Council is currently reviewing unauthorised vehicle access controls on site at Fairhaven Lake with a view to installing additional signage and selective barriers such as bollards. “However the chosen approach needs to allow for operational and emergency vehicle access.